They wouldn't have anything to do with gunmetal or black rims so i chose a satin finish, i think they look pretty nice, i'll post more pics once they are on the car. Unfortuanetly they either scratched the rim during mounting and balancing or shipping, so i'll have to take that up with tire rack tomorrow. Hmmm, can't say I see those looking good on the car just yet. They are 18's, they aren't my first choice but given the budget constraints and requirements i took the risk. There were a nice set of gunmetal enkeis that i wanted to do but that got shot down. They wouldn't even let me do the machined finish with the insides of the spokes painted black... I'm hoping they atleast look decent, and not horrible, if i get to that level, i'll be ok.
Meh, those will be fine. They are for winter, not to re-define style or anything. 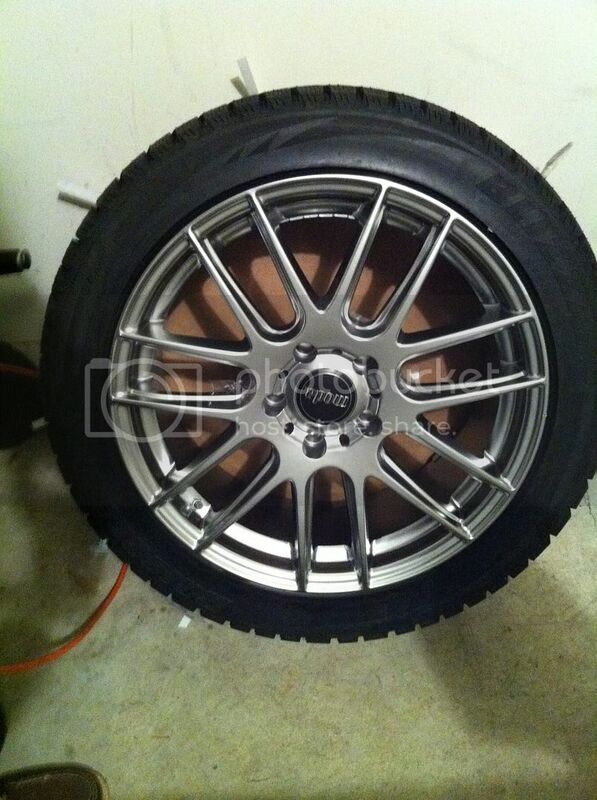 yes, most peoples winter wheels are a rusty 15" steel wheel set. Hell yeah. All the FWD caddys have roll races like all damn day. Then the cruise over to 'Luca's house for some hard parking and body work tips. Yeah if it were my car i would have some black multispokes (found one that were 115 a wheel) but the primary driver is my mother, and she says black wheels are too "gangster", these were like 130 each. That was kinda my thought process, looking decent would be a plus though. Why 18s? Why not 16s and a tall, grippy tire? Probably because the stockers are 19" turbines. I don't think you can go smaller than 17" because of the brakes. 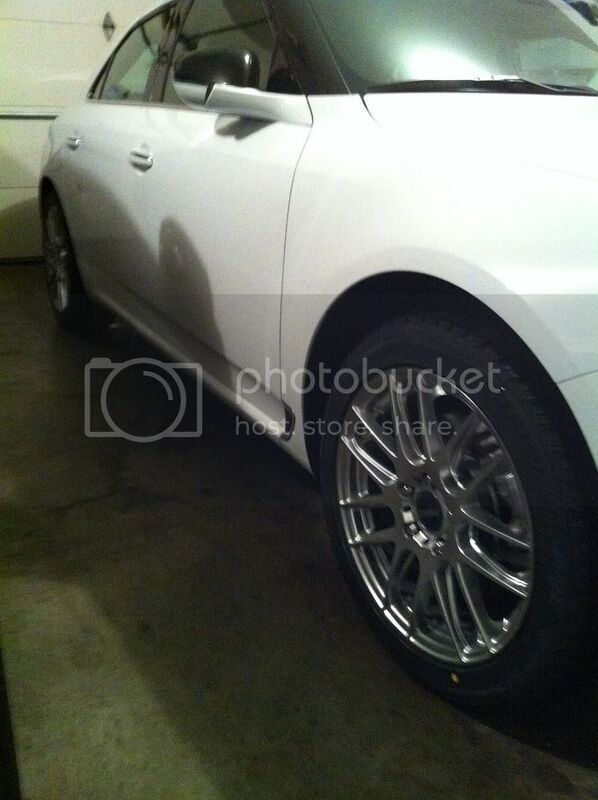 It would look horrible with lighter finish 17's, the car is too big. got the wheels mounted, i'll update with pics later. Apparently tirerack wouldn't allow an exchange if the wheels had been mounted and it couldn't wait (might have something to do with the current snow storm dropping a foot) so they sold me a spare for half price and free shipping, i figure it will come in handy eventually. That kind of makes sense, and not really a bad deal either. Of course if the damage was more significant it probably wouldn't be a good enough fix. yeah i have touch up paint thats similar in color so i'll just touch it up. It was only ~65 bucks so i feel like it was a fair deal. The other option they had given was the same amount refunded on the initial purchase. Good to hear your parents have taste (RE: no black wheels). I'm not normally a black wheel person either, but those gunmetal ones were pretty nice. I'm up @ my place in State College so i had my dad send some pics now that they are on. I'll get some good ones when i drop in on them this weekend. He says they look better in person, we'll see. Last edited by JLausch; 01-26-2011 at 05:41 PM. What's the other car in the garage? Benz of some sort? nah, my dad drives a diesel x5. Actually, I don't think those look too bad. Yeah i think it will work out ok, i won't lie i was a little worried, using their thing on the site to see what it looks like doesn't always pan out well, as i've learned in the past.